Mansfield Burglar Alarms | Mansfield based alarm company, alarm installers & CCTV - Property Guard - Mansfield intruder alarms. Covering Mansfield, Ashfield, Chesterfield, Newark and surrounding areas specialising in wireless alarm technology and HD CCTV. 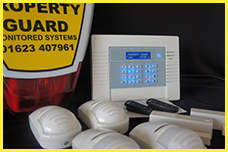 CCTV surveillance systems from Property Guard can be designed for homes and businesses of all sizes. Date and time stamped digital video recording to suit all budgets and requirements. Full quotations provided on completion of a full survey.